To say I was flabbergasted after reading the interview on MileSplit.com with Mark Bubalo, Blue Springs School District Activities Director, regarding the district’s decision to deny Tori Findley and Victor Mugeche the opportunity to run at the prestigious Arcadia meet in California would be an understatement. Enraged, stupefied and sad would be additional emotions I experienced while reading Bubalo’s responses to Cory Mull’s excellent interview. Bubalo is simply acting as the spokesperson for the Blue Springs School District but his words reflect on that body’s competence. Please read below for my comments to Bubalo’s explanations in my Off The Couch format. GH: “It’s just policy” is a lame excuse whether you are a parent repeating it to your kids, a teacher or school administrator dodging a student’s questions or a boss attempting to justify a decision at work. Who makes the policy, Mark? You and the district administrators. Hiding behind this excuse simply inflames those demanding answers. The cannonballs that have taken up residence where my thighs once resided still roll and stab with each forward step. Curbs look like waist-high cement walls to my post-marathon bod. It is in this state of repair that I pen this tale of my trip from Hopkinton to Boston for the running of the 115th Boston Marathon. As marathons go, I am pretty much a noobie. At least that’s what my son calls rookie Xbox players who get trampled by his “supreme awesomeness.” As I approached the age of 55 the summer of 2009, I decided it was now or never to run 26.2. I picked the Tucson Marathon in December because it was downhill and well, it was Tucson in December. Think of the scenery. And even the mountains. I needed a time goal and since a 55-year-old male needed to run 3:45 to BQ (Boston Qualify), that was what I decided I’d run. I ran 3:45 at Tucson and figured my marathon days were done. But qualifying for the Boston Marathon is kind of a revered goal for many distance runners who never make it to Hopkinton. My friends reminded me of this often enough to make me change my mind and put Boston on my Bucket List. My Cross Country Is… verse from 2015 was well received so why not follow it up with a sequel? May your summer training be cool, wet and weirdly wonderful. Cross Country is difficult to explain to your non-running friends. So difficult you have given up trying and answer their quizzical looks with a mischievous grin. Cross Country is that deep intellectual conversation you and your teammates have with your coach about farting while on an early-morning training run. Cross Country is a life-long sport that teaches discipline, self-sacrifice and team goals that you will rely on many years after your last race is run. Why do I post my Baseball Is… verse each Opening Day? Because of letters like the one below. I know that your poem “Baseball Is…” is over 20 years old now. But I just read it for the first time when I was researching the Cincinnati Reds’ opening day (which is tomorrow 4/06/2015). Of which I’m taking my son to his very first opening day. I’ll admit, your poem brought a tear to my eye thinking about my dad. I remember him very vividly taking me out of my elementary school class “kidnapping me” as he called it, to my first opening day when I was my own son’s age. Him playing catch with me in the backyard and coming to all of my games. HE NEVER MISSED ONE GAME all the way from little league through college when I played for Hanover College. My dad has been gone for several years now. But before he passed away from colon cancer, I am so thankful that he had the opportunity to hold my son and love on my boy for the last bit of time we had left with him. I wrote Baseball Is… in 1994 just as the MLB Players union went out on strike. 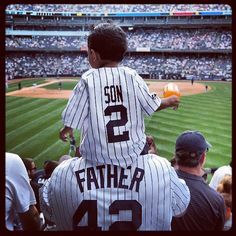 Our first son was just a few months old at the time and I asked myself how I would describe to him this game I so loved if the MLB players never returned. How would you explain baseball to a ten-year-old who had never experienced the game? That son is now 21 years old, as is this poem. These are the words I chose. Baseball is a passion that that bonds and divides all those who know it. And a brow creased in an attempt to recreate a three-hour game from an inch-square block of type.